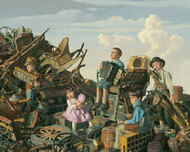 Bob Byerley is one of the foremost painters of children today. His classical, ultra realistic paintings--interpretations of the everyday experiences of the child--awaken in the viewer long forgotten memories. 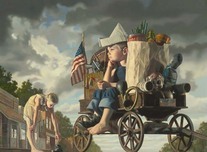 His art combines the precise academic painting techniques of the Old Dutch Masters with the heart and soul of Norman Rockwell. 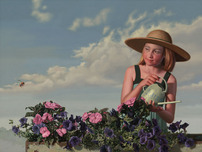 His tender and nostalgic oil paintings evoke the kinder and gentler age of Bob Bylerley's own childhood. 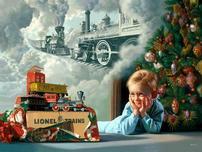 In Bob Byerley paintings, imagination abounds. He portrays children interacting naturally with fairies, elves, and surrealistic imaginary animals. He paints children doing things, rather than viewing things; his kids are alive with vitality and mischief. We invite you to come along and visit the Neighborhood and enjoy some of the finest artwork in realism being done today. 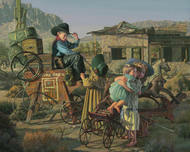 Purchase any Bob Byerley piece IN STOCK and receive 25% off. You must call to receive this discount.